The Manbug FRN ZDP-189 is a Plain Edge Folding Knife from Spyderco which is now also available in British Racing Green colours. It is clipless and hence can carry with ease in your pocket. It supports a lanyard hole along with the trademark David Boye dent for attaching a chord. 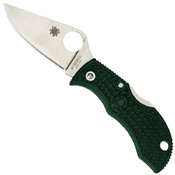 It has an enlarged round hole by Spyderco. The knife sports a ZDP-189 blade. The ZDP-189 is an impressive, high-performance steel blade which Spyderco offers as an option on several best-selling lightweight everyday-carry folders including the Manbug. 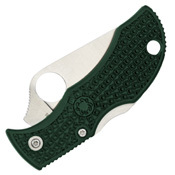 It is engineered for superior control, high level accuracy, and the cleanest of cuts in all kinds of situations, regardless of whether or not the aim is push cuts or slices.